Two words I loathe. I could do without it, yet twice a year, this one hour messes me up badly! Everything is thrown off, and I spend an entire week feeling like an extra cast in the Walking Dead. A week is a long time to suffer. Daylight savings isn’t just about a loss of sleep. It messes with your internal clock that controls your energy and even your hunger levels. We shift our clocks forward an hour during the spring and summer to help conserve energy and give us more light in the evenings, but the change can have an adverse effect on the body. WE NEED SLEEP! Studies have also shown that people are more grumpy and less happy the first week after the clock change. If you have kids, you already know how this change affects them and you. 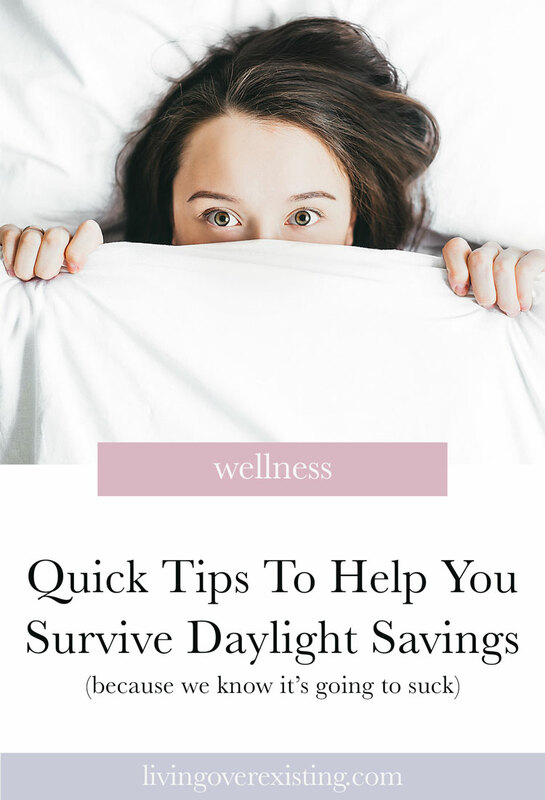 But there is good news: If you’re like me and not fortunate enough to live in Arizona where they’re smart enough not to observe daylight savings time, there are some super simple things you can do to help take daylight savings time by the horns. Simple enough but let your body adjust. Getting 7-8 hours of sleep per night is vital. Listen to your body as your internal clock reprograms itself. You may need a little extra help getting to sleep at night. Try using essential oils or taking a natural supplement like melatonin. Whatever you do, make sure that you make sleep a priority. Getting enough sleep is essential for your mental clarity and focus. Sleep also helps to regulate your heart and your immune system. As you adjust to daylight savings time, don’t neglect sleep. Even if you’re generally used to only getting 5-6 hours of sleep, make it a priority until your body adjusts. Getting enough sleep is essential for your mental clarity and focus. We’re used to laying in bed scrolling until our eyes get droopy. This is a bad habit under normal circumstances, but it’s really bad during the daylight savings shift. The light from our devices stimulates our brains and keeps us awake longer than we’d like to be awake. It may be really tempting to do a little Insta-scrolling or watching TV, but for this week while your body is adjusting, block out all outside stimuli. Actually turn off your devices. If you have to keep them on, plug them in across the room. The way to beat daylight savings is to do all the things that promote sleep and avoid anything that will keep you from getting those zzz’s. By Tuesday of daylight savings, it feels as if 30 days have gone by. Mornings are so hard. For this week, plan ahead. On Sunday, make your plan for the week. Plan and prep all your meals so in the morning you can just grab and go. Check out Pinterest to find new easy breakfast and lunch recipes that help save you and your family some time. Pick out your clothes for the whole week. Instead of fumbling through a tired fog in the morning, already have your clothes ready. One less decision to make helps you not feel as beat in the morning. Make time to get your body moving. Exercise will not only help you sleep better, but it also helps your internal clock to adjust. Exercise will get your heart pumping and your blood flowing and help to regulate your body during the transition of the first week. Consistent, frequent exercise is the key to telling your body what time it really is. Get creative with your exercise this week. Get on Youtube and find a video you can do. Find some great workouts on Pinterest. Get together with friends and make a challenge to get working out. The workouts will be important to help you create a new routine for your body right after daylight savings. Exercise will not only help you sleep better, but it also helps your internal clock to adjust. The only good thing about daylight savings is more extended light hours. Get outside and enjoy it. We’ve been cooped inside for months so get outside and get some fresh air. Take a walk, go for a bike ride, sit on the porch. The vitamin D from the sun plays a crucial part in getting your internal clock back on track. It helps produce what you need for a good night’s rest as well. Getting outside is mood boosting and energy producing. The sun is a natural cure for all the ailments that the time change creates. BONUS: Exercise outside! Go for a two for one! You may be tempted to over-caffeinate, but don’t do it! All that caffeine will be counterproductive to the rest you need at night to adjust to the time change. Although it may help you at the moment, when it’s time for bed, you’ll be wired. I’m not saying don’t drink any coffee but consider your intake of coffee vs. water. Instead of drinking 6 cups of coffee, drink more water. Drinking more water will ensure that you are properly hydrated, and your body has what it needs during the day. Proper hydration produces the energy you need to keep going during the day. It also promotes mental clarity and focus. Drinking a glass of cold water at night also has great benefits for your sleep. The cool water will cause your body to relax as you wind down, aiding you in getting a full night’s rest. Proper hydration produces the energy you need to keep going during the day. You may be tempted to keep the same routine that you had and try to do all the things. Don’t. Give yourself some grace this week. Lighten your load. Keep your schedule flexible. Schedule in time to take a nap. LISTEN TO YOUR BODY! Make self-care a priority. Daylight savings is hard on everybody. Don’t feel as if you have to be superwoman this week. Spend some extra time with your kids and with your spouse this week. The adjustment period is hard. It’s okay to slow down this week. You probably need it anyway. Brittany is a blogger and podcast host where she shares the life lessons she learns and how to help others grow from her experience. She is also the LOE editorial assistant. Visit her website.